The MA Policy Analysis and Evaluation Program at Stanford University was rated number one in the country by US News and World Reports. The placements range from research corporations to foundations and from small non-profits to the White House. 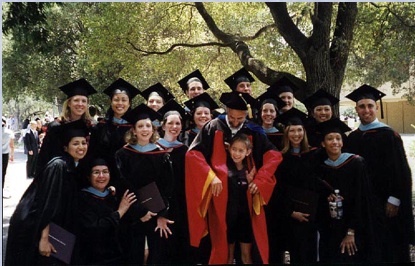 As the Director of the Program for a decade, I had the privilege of seeing my students make a difference in the world.The last class of this extraordinary program was in 2003. 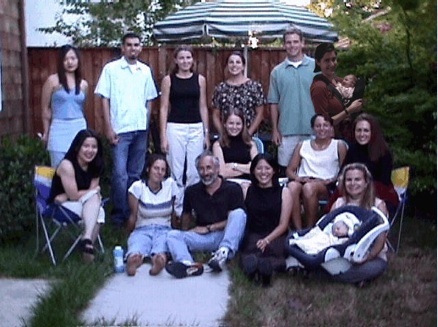 We also get together casually for lunch, reunion dinners or a Frappuccino when we can (long after graduation). The most up-to-date information on each of our graduates is now on Facebook. Left to right back row: Sepehr Moghadam (Independent Evaluation Consultant), Dana Russo, Sarah Lohrius (School of Medicine), Shelley Tadaki (School of Medicine), Vanessa Ochoa (UCLA - Ph.D. Program), Megan Zander (Rand Corporation), Frank Kobayashi (My Life - Start-up Magazine for Community Colleges), Molly Knott (Portland), Elizabeth Thurston (OERL -SRI International), and Josh Stern. 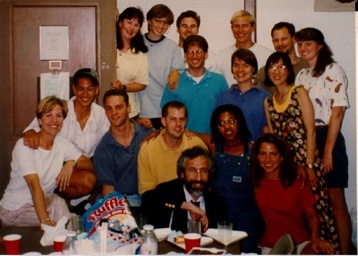 I am in the center with the beard, glasses, and tie: Director David Fetterman. Left to Right: Jiny Kim (Washington, D.C.), Brianne Ford (San Francisco Unified School District - Teacher Recruitment), Elsa Jacobsen, Candice Bocala (DC Teaching Fellows), Kris Kim (UCLA Doctoral Student), Stephan Lavertu (Ohio Department of Education), Dylan Blair (Morgan Stanley), Anita-Yiu Suen (Bureau of Labor Statistics, formerly School of Education at Stanford University and the Stanford Center for Professional Development), Inge Bond (Stanford University Medical School), Miriam Rokeach (Justice Matters Project), Alicia Valencia (Scripps - Admissions), Sehba Zhumkhawala (KIPP), Kathryn Hopkins (Gardner Center), Sara Maranowicz (East Bay Conservation Corps, formerly Businesses United In Investing, Lending and Development), Carolyn Hack (Branson School). Center: David Fetterman (Director). 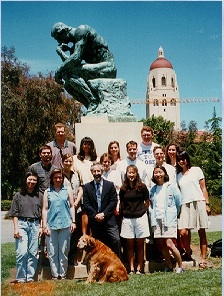 Top row: Eunkyoung Um or Ann (Teachers College, Columbia University), Joel Rangel (Making Waves), Adele Barrett (Santa Cruz, New Teachers Project, formerly American Institutes for Research), Rachel Demma (Westat), Andrew Davis (American Institutes for Research), and Suzanne Alpert (Lick Wilmerding High School). Suzanne is holding Baby Hannah (one of the two youngest members of our program ever - May 23, 2001 at 9:40 am). Middle row: Cassie Bowman (NASA), Britt Jung (Presidential Management Intern, US Department of Education), and Jodie Stout (WestEd). Bottom row: Jackie Wong (WestEd), Andrea Main (Monarch Academy, ASPIRE Charter School in Oakland), David Fetterman (Director), Jennifer Su (Sociometrics), and Melissa Fischer (Center for Primary Care and Outcomes Research at Stanford, Stanford Hospital). Melissa is holding Baby Madeleine (one of the two youngest members of our program ever - May 23, 2001 at approximately 10:25 am). 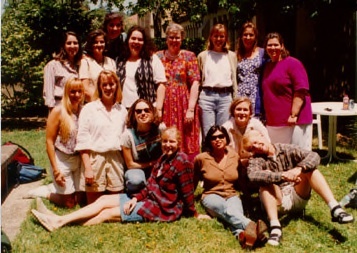 Bottom row, left to right: Ingrid Roberson (Center for Research on Evaluation, Standards, and Student Testing and CSE, the Center for the Study of Evaluation), Giselle Lundy-Ponce (American Federation of Teachers, D.C.), Julie White (The MONY Group, MONY Foundation), Amy Merickel (American Institutes for Research), Tricia Tulipano, David Fetterman and his daughter Sarah in robes, Catherine Sousa (Potomac School in Virginia), Emi Kuboyama (PACE, Policy Director, formerly U.S. Department of Education - Office of Civil Rights), and Liv Newman (Magnet School Teacher, New Orleans). Top row, left to right: Melissa Eiler (Stanford University, APA doctoral program), Vivian Haun (Stanford University, PACE Project), Carol Studier (Haas Foundation), Marc Levenson, Michael Broom (SRI International), Stacey Beese (Stanford University, BASRC, Cori Lee (CISCO), and Steven Pariani (WestEd). 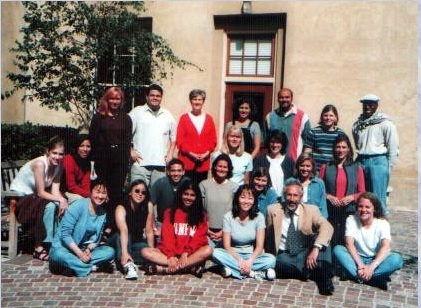 Top row, left to right: Traci Martens (U.S. Department of Education), Al Heredia (WestEd - southern California), Jane Cooper (Rockman Associates), Lisa Bellesteros (American Institutes for Research), Parag Joshi (Teachers College, doctoral program), Lori Riehl (SRI International), and Paul St. Roseman (RISE - Menlo-Atherton High). Middle row, starting with folks on the bench, from left to right: Jennifer Dietz (Quality Evaluation Designs - NSF Evaluation), Nicole Burrell, then shifting to the center of the picture: Katherine Rynearson (EduVentures - Boston), Tamara Schurdak (The Bryn Mawr School), Aimee (Madison) Scribner (Legislative Assistant for Assemblymember Virginia Strom-Martin, formerly at University Public Schools - charter management company), and Brook Troy (University Public Schools - charter management company). Row of three immediately behind first row, from left to right: James Wright (French-English bilingual school called Lycee Francais de Los Angeles), Ellie Fischbacher (Dean's Office, School of Humanities and Sciences, Stanford University), and Jackie Vargo (EdSource, formerly Dean's Office, School of Humanities and Sciences, Stanford University). Front row, left to right: Huey Lin (American Management Systems), Sandy Paik (Poverty & Race Research Action Council and Georgetown), Purvi Mody (Children's Health Council, Achieva, American Management Systems), Hemmie Jee (American Management Systems), David Fetterman (the Director), and Kristy Ogren (Responsible Driving, Inc., Denver, CO). 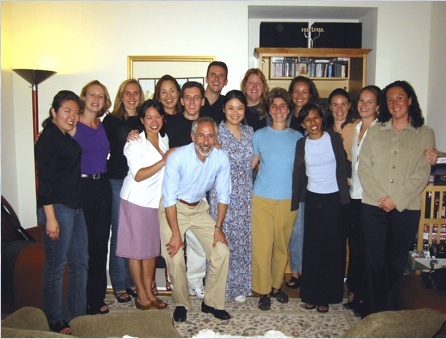 Middle Row, left to right: Susan Lee, Tom Matos (Director of Admissions, New York Law School), Abby Rovner (Charter Schools Development Center, formerly California Tobacco Evaluation Project), Cari Pang (Haas Center, formerly San Francisco Foundation), Bridget Peksa-Rice (California Tobacco Evaluation Project). 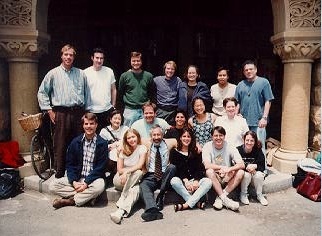 Bottom row, left to right: David Ogden (WestEd), Sequoyah Silver (Smith Barney), David Fetterman (Director), Wendy Connors (Graham Windam, formerly MDRC in New York and STEP Evaluation Project), Gregory Browers (CISCO, formerly STEP Evaluation Project), and Deborah Holtzman (WestEd, formerly San Mateo SMILE-IT Technology Evaluation Project). Top row, left to right: Keith Gayler (Policy Studies Associates in D.C.), Mary Haywood (Inverness Research Associates), Ellen Hong (Rutgers Law School), and Robin Lasota (North Central Regional Educational Laboratory). 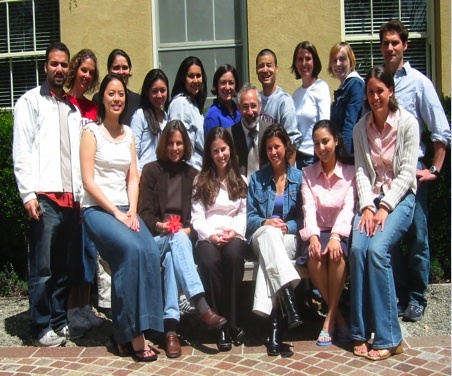 Middle row, left to right: Larry Ma (Boston College - Law School, formerly Stanford University Chemistry Department Admissions - previously the Stanford Integrated Manufacturing Association evaluator), Carol Rava (Partnerhship in Education - Seattle), Karen Waters (Pyramid Communications - Seattle), Heidi Hulse (Charter School Teacher and North Central Regional Educational Laboratory), and Carlo Cerruti (teaching at Nueva - Hillsborough, formerly teaching at Lakeside Upper School - Seattle). Bottom row, left to right: Carrie Penner (Policy Analysis TA for 1996-97 and Ph.D. student in the School of Education at Stanford), Tony Byrd (Principal - Farham Elementary School, formerly Prospective Principals Program and Teach for America Recruiter), Toia Thompson (WestEd), David Fetterman (Director of this wonderful program), Kari (Becker) Stewart (Joint Committee to Develop a Master Plan for Education, formerly WestEd, California School Boards Association, Public Policy Institute of California), Dina Banks (Ravenswood School District), and Jon Oram (Yale Law School). Top row, left to right: Sally (Shuper) Allen (San Mateo County Community Information Program), Monica Goebels (Jazz Interactive educational software), Julia Dorfman (WebTV), Anabel Aportela (Arizona State Department of Education), Mary Stenseth (consultant), Liza O'Neil (Texas Christian University), Kimberly Cardinale (Deloitte and Touche), and Jennifer Ballen (U.S. Department of Education). I am right in the middle on the bottom (the one with the beard and tie). Top row, left to right: Susan Scharf (WestEd), Kyo Yamashiro (WestEd), John Luczak (U.S. Department of Education, formerly SRI International), Joe Burghardt (law school), and Andrew Katz (Israel). Middle row: Jett Pihakis (TA), Kara Finnegan (SRI International, previously at Research, Policy, and Practice, as well as George Lucas Education Foundation), and Wilma Chan (elected official California Assembly, formerly Alameda County Supervisor). 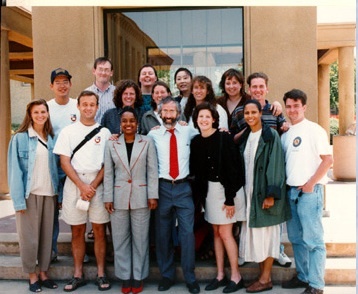 Bottom row, left to right: Kelly Amis (Parent Choice in Milwaukee, formerly Fulbright Scholar and Dianne Feinstein's Office), Abe Wu (graduate school), Peter Henig (Christmas in April), Brad Haggerty (school to work program - connected with the Boy Scouts of America), Katrina Waiters (U.S. Department of Education), and Trish Striglos (Teach for America).